The Public Employee Safety and Health is a job safety law poster by the Wisconsin Department Of Workforce Development. This poster is mandatory for some employers, including public sector employers. This poster must be posted in a conspicuous place by all public sector employers so employees can see it. This poster describes the health and safety regulations in the public sector and describes when an inspection can be requested, when this law is enforced, and what happens to employers who discriminate against employees for exercising their rights in accordance with this law. It appears you don't have a PDF plugin for this browser. 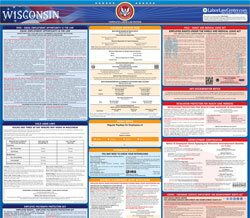 Please see the link below to download wisconsin-sbd9301.pdf. standards	 promulgated	 by	 Federal	 Occupational	 Safety	 and	 Health	 Administration	 (OSHA). department	 decides	 not	 to make	 an	 inspection,	 the	 requestor	 will	 be	 notified. top	 elected	 official,	 the	 bargaining	 unit	 and	 to the	 person	 requesting	 the	 inspection. disputed	 they	 will	 be	 reviewed. employee,	 may	 file	 a complaint	 with	 the	 state	 Division	 of Equal	 Rights	 within	 30	 days.